With more than three decades behind it, Microsoft Excel has grown to arguably become one of the most important software programs in existence. When used in small businesses, there’s really no limit for its applications, from creating revenue growth models to planning an editorial calendar, to creating a budget and summarizing customer revenue, it’s clear to see why the program has become entrenched in business processes worldwide. According to Small Biz Trends, this powerful program is still used by at least 69% of small businesses such as electricians, lawyers, and plumbers. Unfortunately, there’s one major drawback that small businesses have to deal with and that’s the fact that excel requires manual entry and in this fast-paced world, that’s a problem. In this article, we will explore the cons of the excel spreadsheet and why businesses are turning towards mobile applications instead. 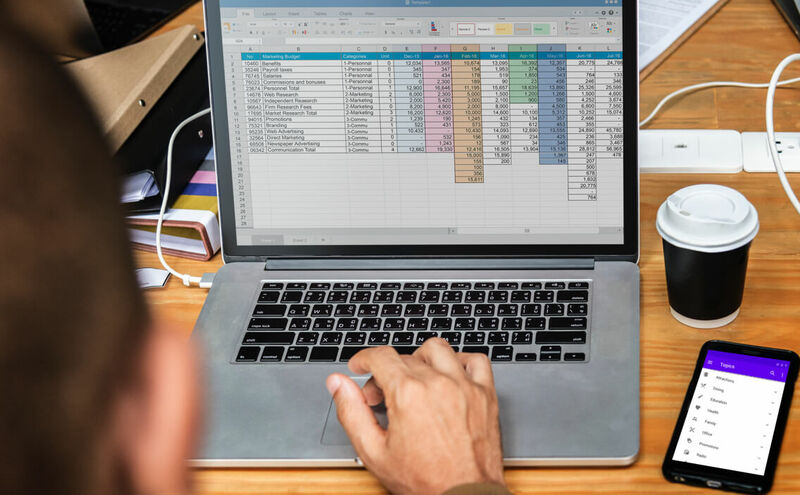 Although there is nothing inherently wrong with spreadsheets as they are an excellent tool with a diverse range of applications, there are some major negatives associated with them when it comes to business specifically. Due to the fact that you are seeing all of the raw data at once, it can be difficult to understand the importance of the data. Although you can use visualization tools to highlight the important strains of data, it can still be hard to see what the information is telling you. For individuals who do not work with excel on a day to day basis, they can be difficult to analyze. This is made worse by the amount of data that can be presented to an individual. It is very easy to misinterpret the raw information being presented to you which can lead you to make poor choices for your team based on the misinterpretation. Spreadsheets are not designed to store historical data and so when a user tries to keep a spreadsheet at a manageable size, they are often updated with only the new information. This leads to historical data getting deleted which make it difficult for understanding and comparing data trends across large time horizons. One of the appeals to spreadsheets is that they can do all of the calculations and math for you but the downside to this is that if a formula is inserted into the spreadsheet wrong, the related computed data will throw off every single cell that gets affected by the formula. This creates a nightmare to fix as you then have to retrace your steps to ensure that you correct the incorrect data results. To put it more simply, human error has disastrous results. Unfortunately, spreadsheets are not secure as they do not have any built-in safeguards other than password protection, which can be easily hacked or accessed by unauthorized people. Beyond this, the integrity of the data can be easily mismanaged which leads to a greater risk of data corruption. When using Microsoft Excel, spreadsheets can be shared among the office but they cannot be updated by multiple people at the same time and so only one user can change the data. If local copies are made and are not updated to reflect changes, users will not have access to new data that gets inserted into the main document. In addition to this, there is no file history, so no matter who makes the changes or when the changes get made, previous information is lost. In order to avoid these negatives, many businesses are choosing to convert from excel spreadsheets to mobile applications instead, which can not only simplify your business’ management of data and data updates but can provide you with more security layers. Here are a few reasons why you should consider turning spreadsheets into mobile applications. One of the major issues with excel is that you can hide columns and rows when you do not need them and if you are a business that uses excel a lot, staring at rows and rows of numbers gets tiresome after a while, so it is easy to just hide them instead. Unfortunately, this causes information to go missing and data to get riddled with errors. You can avoid this by managing your data in excel and then converting it to an app. This removes unwanted errors, like hidden rows and columns. By converting your excel spreadsheet into a mobile application, you will be able to send files to anyone from anywhere, even when you are not at the office. Plus, those on the receiving end are far more likely to open up and look at an app than an excel spreadsheet. With spreadsheets, because only one person can update it at a time, it’s very easy to lose track of which file was updated last which ends up causing a whole slew of iterations of the same document. By creating a mobile app instead, this removes the hassle of maintaining and tracking all of the various sheets. Rather than worrying about your spreadsheet getting hacked or your password getting leaked, a mobile application can provide a more secure experience. In converting your spreadsheets to a mobile application, you get a return on investment as you reduce your risk of losing money due to spreadsheet errors. By turning your manual spreadsheets into a mobile application, you can automate operations like customer complains, contact information updates, product and service card ratings, employee payroll, invoicing, cost calculations and estimations, sales forecasting, lead nurturing and, of course, lead capturing. So Why Choose Let’s Nurture For Your Mobile App Development? Get in touch with us today to find out what other benefits you can reap by converting your spreadsheets into a mobile application for your business.